Rich text editors, a thorn in my side. The last hour was spent downloading a custom build of CKEditor. My website no longer has no built-in authoring tools like a fancy CMS might because I disabled the old ones. They are in need of a complete rebuild. Now I have to write my blog articles directly in MySQL queries. While I certainly could write HTML code to insert, it is extremely tedious to do for my long posts. In comes a WYSIWYG rich-text editor to help out. It makes typing paragraphs and text styling a bit easier, then I copy the source code into MySQL. Not elegant, but it works. Even more ideal would be an offline authoring app. A stable working environment that constantly saves as the user types is the golden standard ever since Gmail and other Google products offer this safety net. Without this AJAXy save-as-you-type, it is possible by some accident or network glitch to the results of several hours of typing. That just happened a while ago, though perhaps only an hour's work was lost. The worst part is resetting my brain back to where I started and typing the same thing again. Torturous. There are probably authoring tools that make use of browser offline storage. Native phone or desktop apps would be another solution, but I don't feel like searching right now. Tonight's solution is to type in a locally running CKEditor instance and paste the source code into MySQL. Why does it take me so stinking long to find buttons in rich-text editors? Does it take anyone else seconds or minutes to find the add hyperlink button? Even in Gmail I have to pause for a second because the link and attachment buttons are very similar. I love the full set of tools offered in CKEditor. Even if I never use over half of those buttons, I like having them there. Even so, it would be profitable to get rid of the ones I never use and arrange them sensibly so less time is spent hunting for them. Set a timer. How long does it take you to locate the link button below? Blog comments are currently disabled, so you'll have to keep your answer to yourself. If you yell the answer, maybe your neighbors will hear you. After previewing this post, there's no way anyone can locate the icon. My blog is now arranged into CSS columns for easier readability on larger screens which forces the image to be quite small. Eventually I might add a lightbox plugin so all blog images can be clicked for a larger version. For now, just use a magnifying glass. Speaking of wizzy wigs, Froala is another nice looking option. In my opinion they are all basically the same. The only quality that matters is being able to use them on any device without requiring a huge script size. Eventually perhaps rich text editors will be built into CSS, and large script attachments will be a thing of the past. Any form of user input exposes a site to security threats. This is in fact why I disabled my old blog authoring scripts and feedback forms. They need to be redone, and I don't feel like doing it right now. Strangely, even though my old forms were very poorly coded, I never got much if any spam as the result. My site has never received much attention on the internet because it's of no consequence in the world. Commenting services like Disqus are a consideration. I might end up using something like that, but I won't use a paid service. My website isn't a source of income, so I can't justify additional monthly expenses. Plus, I read that Disqus now includes ads in their free version. I hesitate to inflict my site with ads. Back to Froala. I was done with this post a few paragraphs ago, but I couldn't resist the pun exploration. WYSIWYG editors (What You See Is What You Get) remind me of two things: wizards (WYZ... wiz) and hairpieces (WYG... wig). Froala has a similar divide. Fro is a well-known moniker for hairstyle (wig... fro). Ala reminds me of a magic word such as Alakazam (wiz... ala)! I have just the thing. I've got Fro. 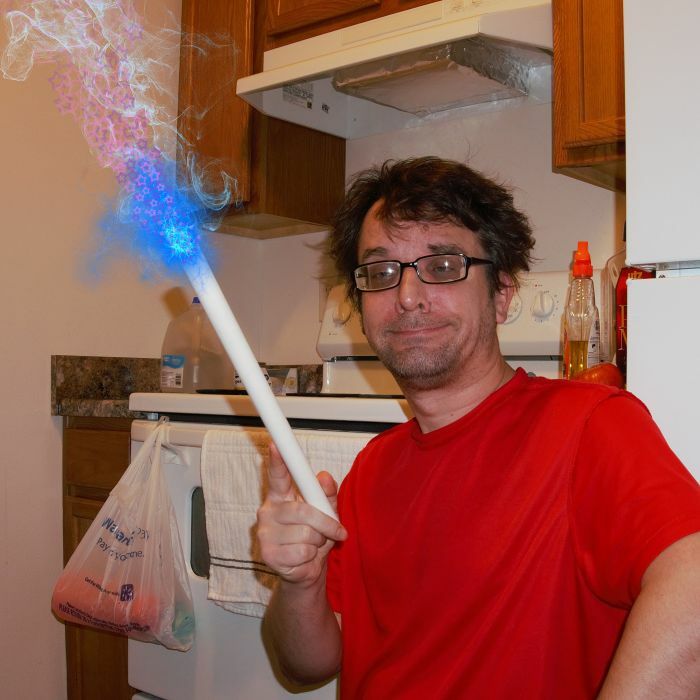 I've got magic PVC pipe. Hairy Potter in his later years.